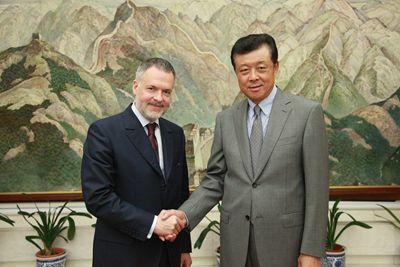 On 1 July, Ambassador Liu Xiaoming met with the new Director of the British Museum Hartwig Fischer at the Embassy. Head of the Department of Asia Jane Portal and Curator Jessica Harrison-Hall from the British Museum and Minister Counsellor Xiang Xiaowei of the Cultural Section of the Chinese Embassy were present. Ambassador Liu said that, with bilateral relations entering the "golden era", China-UK cultural exchanges and cooperation have flourished. The British Museum is one of London's favorite attractions for overseas tourists and a must-go for tourists from China. In 2014, the British Museum presented the exhibition Ming: 50 Years that Changed China, showing to the world the long history and civilization of China. The exhibition was highly acclaimed and became a good example of cooperation between China and the UK. Ambassador Liu hoped that, under the leadership of Director Fischer, the British Museum could achieve greater progress in cooperation with China by presenting more brilliant exhibitions to visitors from the two countries and the world. Director Fischer said that the British Museum always attached importance to the cooperation with China, haing established long-term partnerships with the Palace Museum, the National Museum of China, and Dunhuang Academy China, among other institutions. The friendly relationship between Chinese institutions and the British Museum has extended to their staff. Researchers and administrators from both countries have forged strong friendship through their long-term cooperation. This is also an important basis for the development of the British Museum. The British Museum will continue its cooperation with China and continue to improve services in Chinese language to improve the experience of Chinese tourists.